Writers and Artists: Gilbert Hernandez, Jaime Hernandez and Mario Hernandez. 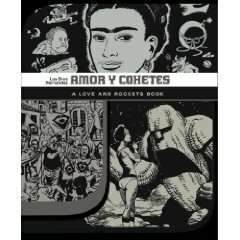 As a total “Love and Rockets” virgin, possibly I’m the wrong person to be reviewing this, since I knew nothing about the series prior to reading this book, which is a collection of short stories and one-shots by Los Bros Hernadez from the back pages of the main “Love and Rockets” book. Then again, one of the joys of reading comics is the chance to try something new, and one of the requirements for being a good comics reader (probably the only requirement) is the willingness to try something and make the effort to engage with it. With this in mind, I will admit that at first I found Amor Y Cohetes a little hard-going. It takes a while to get into the sheer surreality of the whole thing! However, once you are willing to let go of your brain’s demands to try to make sense of the whole thing and expand your mind to go along for the ride, there’s a lot of fun to be had. The stories range from silly to serious, from the incredible to the everyday, from biographies of Frieda Kahlo to planet-hopping sixteen-year-old girls with talking robots. Best of all, you can dip in and out of it – the longest stories are about 16 pages long, so it’s a good book to pick up whenever you feel like it. There is some swearing, sexual references and violence in, although nothing really 18-rated (more like your 15-rating). The only exception to this, and the one story I really did not like, is on p.282. I’ll say little about it except that, whilst I acknowledge that no topic is off-limits to art, if you’re going to write about suicide, the results should justify the topic choice, and this just left me feeling grey and wondering “what was the point of that?”. Other than that, it’s a fun and surreal book. Give it a try and see how you go!